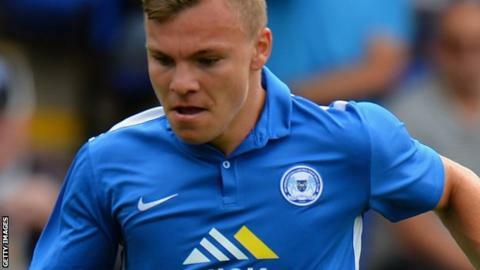 Peterborough bounced back from Saturday's 2-0 defeat at Rochdale to knock Crawley out of the League Cup. Conor Washington quickly opened the scoring with a cool finish from Harry Anderson's right-wing cross. League Two Crawley almost levelled, but Matt Harrold headed Luke Rooney's cross against the post. The League One side made sure of their passage into the second round when Marcus Maddison fired past Freddie Woodman from 18 yards. "Lots of encouraging signs, but the disappointing thing is the goals we've conceded. Particularly after the second goal, I just thought we could have been punished a couple of more times just through dropping our shoulders and heads and accepting getting beaten. "I accept that we are going to make mistakes but it is how we react because I want us to defend solidly and defend properly, but we didn't. "I want more and more from them all the time, because we had five players on the bench, and to be honest no-one is nailing it down and saying they want a place." Match ends, Peterborough United 2, Crawley Town 0. Second Half ends, Peterborough United 2, Crawley Town 0. Attempt saved. Jon Taylor (Peterborough United) right footed shot from the left side of the box is saved in the top centre of the goal. Attempt missed. Joe McNerney (Crawley Town) header from very close range is too high. Corner, Crawley Town. Conceded by Ben Alnwick. Attempt saved. Luke Rooney (Crawley Town) right footed shot from outside the box is saved in the top centre of the goal. Attempt missed. Jon Taylor (Peterborough United) left footed shot from outside the box is too high from a direct free kick. Sonny Bradley (Crawley Town) is shown the yellow card for a bad foul. Kyle Vassell (Peterborough United) wins a free kick in the attacking half. Substitution, Peterborough United. Jon Taylor replaces Marcus Maddison because of an injury. Alex Davey (Peterborough United) wins a free kick in the defensive half. Attempt missed. Sonny Bradley (Crawley Town) left footed shot from the left side of the six yard box is close, but misses to the left. Lee Barnard (Crawley Town) wins a free kick on the right wing. Harry Anderson (Peterborough United) wins a free kick on the left wing. Foul by Luke Rooney (Crawley Town). Foul by Tobi Adebayo-Rowling (Peterborough United). Luke Rooney (Crawley Town) wins a free kick in the defensive half. Substitution, Peterborough United. Kyle Vassell replaces Conor Washington. Substitution, Peterborough United. Souleymane Coulibaly replaces Joe Gormley. Attempt missed. Gwion Edwards (Crawley Town) left footed shot from a difficult angle and long range on the left misses to the right. Matt Harrold (Crawley Town) wins a free kick on the right wing. Harry Anderson (Peterborough United) wins a free kick in the defensive half. Attempt missed. Lee Barnard (Crawley Town) right footed shot from outside the box misses to the right. Attempt missed. Luke Rooney (Crawley Town) right footed shot from outside the box is close, but misses to the left. Attempt missed. Matt Harrold (Crawley Town) header from the centre of the box is just a bit too high.